Even though these steps are repeated over and over and over, I cannot for the life of me remember if it's knit-wise or purl-wise first and which is it for which needle -- you get the idea. Well yesterday while grafting my prototype sideways sock I had an epiphany. Instead of thinking about moving the tapestry needle knit-wise and purl-wise why not think about moving it in to the middle and out from the middle. 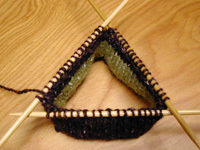 This makes the directions consistent -- let me repeat, consistent -- for both the front and the back needles. Before I knew it I was cruising down the needle grafting and singing "In, Drop Off, Out, Leave On", and not worrying a bit if it was the front needle or the back. Thus endith my epiphany. If nonaGrafts, then you can too! Thank you to all the creative commenters who participated in Sunday's Quiz. Many of you sleuthful knitters correctly deduced that the textural difference observed in my Baby Bell Bottoms was due to knitting back and forth -- the legs -- verses knitting in the round -- the body. Although it's possible -- as Ava suggests -- that "one too many of the aforementioned Starbucks beverages" might have played a marginal role. nona's embarrassed that her rowing out is so clearly visible. And the cause? 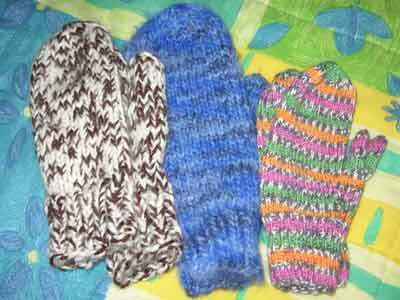 I knit using the "Western" method, which means I wrap my yarn counter-clockwise when both knitting and purling. Although this sounds impressively consistent, it does mean that my purl stitch uses slightly more yarn than my knit stitch. 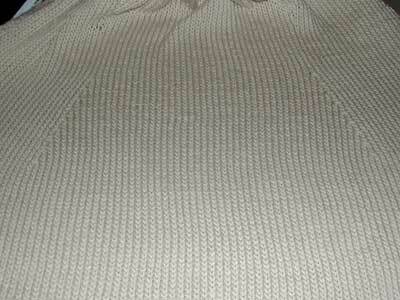 I first discovered the inadequacies of my enlarged purl stitch when solving my saggy ribbing problem. Priscilla Gibson-Roberts calls this phenomenon rowing out and comments that "it is not a mark of excellence". Ouch. My rowing out is not always visible, but Calmer -- a cotton and microfiber yarn -- seems to accentuate the slightly bigger purl stitches. The solution? I suppose I have 3 solutions -- 1) live with it, 2) add more tension to the yarn when purling, or 3) create my purl stitch using the same amount of yarn as the knit stitch by wrapping the yarn in the opposite direction -- clockwise. I think this calls for some swatching! I like new things. I like change. I like experimenting. With the blanket I'm knitting for 3 day old nona-niece-the-newest -- who, by the way, is super cute -- I'm trying several two new things; the Addi Turbo Lace Needles and the Russian Join. The new Addi Turbo lace needles are wonderful -- dare I say perfect --- and worth every single doggone penny -- 1595 of them. The tip, the cord, the metal, the join -- what more can a girl ask for, except a larger range of needle sizes. Excellent review and additional details here. Weaving ends in is my knitting nemisis. It's high time for a change. Time to try one of the many yarn joining techniques out their. For this yarn I selected the Russian Join. 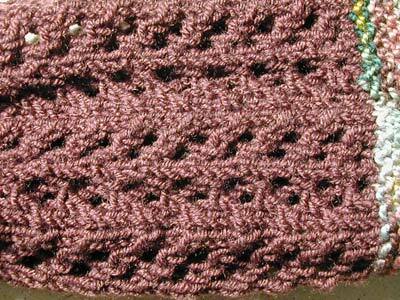 So far so good -- the join is a tad bit bulky, but is not visible with this yarn and stitch pattern. Are you ready for a change? Try something new! 6:00pm PST -- March Madness is in full swing! 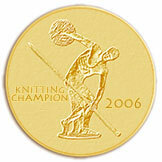 We have 4 "Knit Pickers" tied for 1st place -- Deb, Melissa, Preeti, & Kate -- with many more in hot pursuit. My love for color, short rows, and log cabin construction coupled with my fascination with the quilts of Gee’s Bend and Nancy Crow have inspired my improvisational knitting. 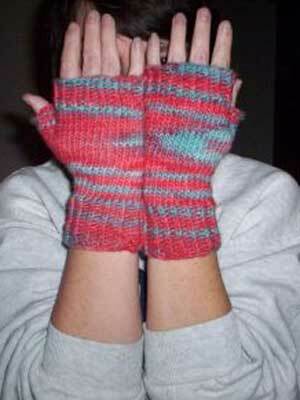 I've written a tutorial for those interested in giving improvisational knitting a try. 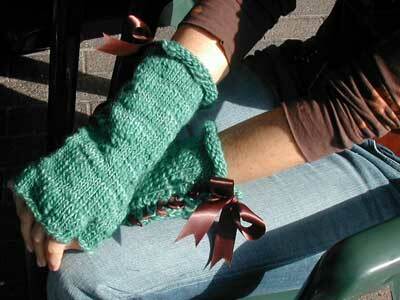 Curiosity and a sense of humor are the only prerequisites for learning this style of knitting. Once you understand — and are comfortable — with the techniques please abandon my instructions and let your own creativity take over. Experiment! Be curious! Don’t be afraid of failure! What’s the worst that can happen!? It’s only knitting. Not interested in a full tutorial? 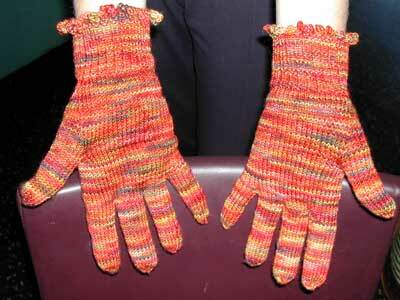 Continue reading for a list of improvisational knitting "rules of thumb". 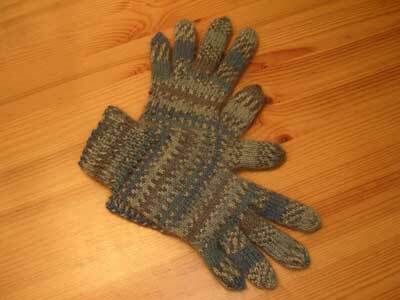 Here are a few heuristics to consider for your own improvisational knitting. These are not hard and fast rules, please experiment and find what works best for you and your knitting. Whenever you encounter a YO, knit the YO together with the next stitch. This closes the gap caused by turning mid row and keeps your stitch count consistent. Add a new color on a right side row. You’re going to have a lot of ends, so knit your ends in as you go. I typically knit the old color’s end in on the 1st row of the new color and the new color’s end in at the next opportunity. When you add a new color, level off the current shape — more or less — before adding any new wonkiness. This keeps the piece from getting too lop-sided. For greater complexity and depth of color, use several shades or textures of the same color. Think about line verses shape. 2 rows will read as a line, while 4 or more will read as a shape. Keep it improvisational! Don’t think or plan too much. Turn when you feel like turning! Likewise, change colors or work in a different direction when your eye or intuition tells you it’s time. For any edge that will be seamed, the edge stitch will be incorporated into the seam allowance and lost to the wrong side of the piece. This plain and simple fact is vitally important when the piece is worked in a pattern stitch. 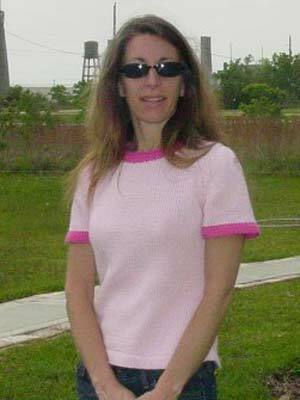 For example, the sleeves of my EZ baby sweater were worked back and forth and then seamed. Even though the pattern called for 42 stitches -- the lace pattern is a multiple of 7 stitches -- I added an extra stitch on each side of the sleeve. 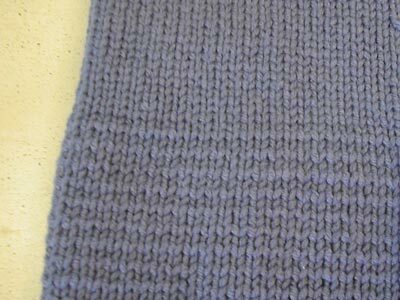 These edge stitches became the seam allowance when the sleeve was sewn together and allowed the stitch pattern to flow uninterrupted through an invisible seam. 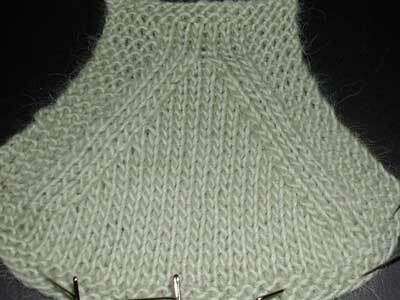 I prefer to work my edge stitches in stockinette stitch -- knitting them on the right side and purling them on the wrong. Patterns -- even well written, clever patterns -- are merely suggestions to the intelligent. 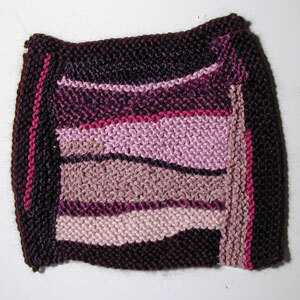 It is the wise knitter who adds her own knowledge, skills, and craftsmanship to each and every project. After all, it is Knitter's Choice. Many, many thanks to Margaux and to Whitney for recommending a Provisional Cast On when working a turned hem. Always in an experimental mood, I tried this technique for my sleeve hem. Can I tell you, it was much, much, much -- did I say much -- easier than picking up the cast on stitches. 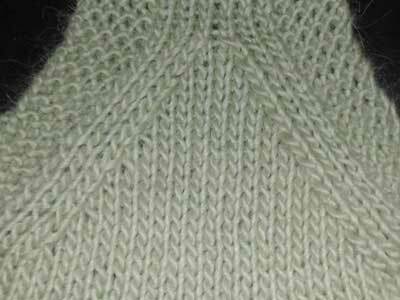 The live stitches created by the provisional cast on also ensured a straight hem alignment. Is "Provisional Cast On" Greek to you? In a nutshell, a provisional cast on creates two sets of live stitches, the first set ends up on your knitting needle and are worked first. 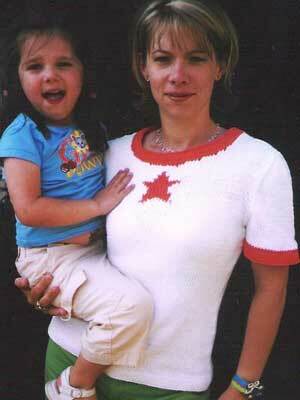 At some point -- in the near or far future -- the second set are taken and worked in the opposite direction. 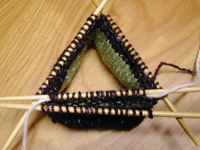 There are two basic ways to work a provisional cast on -- check out the videos for The Invisible Provisional Cast On or The Crochet Provisional Cast On. Fold the hem inward along the turning edge. 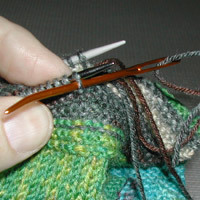 Take the live stitches from the provisional cast on and place them on a separate needle. 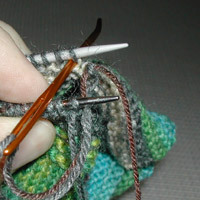 In this picture, the live stitches were held on scrap yarn -- the white yarn -- and have been transfered to a spare double pointed needles -- the back needle. I can now removed the scrap yarn, it's done its job. 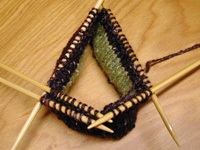 Knit two stitches together. One stitch from the front needle -- a sleeve stitch -- and one stitch from the back needle -- a hem stitch. Repeat across the needle, joining the hem to the sleeve. 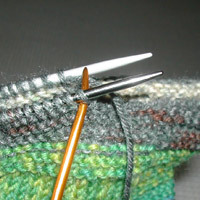 This technique is similar to the 3 needle bind off without the bind off. Once you're all the way around, the hem is completely turned and beautifully joined to the sleeve. Easy as pie! Last fall at the Olema knitting retreat -- or workshop depending on your perspective -- my friend and I stalked a wonderful cardigan. 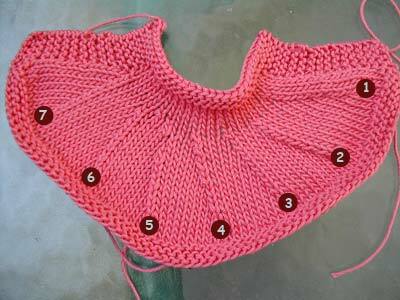 Think seed stitch details, dart waist shaping, lapel collar, and silk/wool yarn. The kind of sweater that improves any outfit, including your pajamas. Yes we're both knitting one, jointly creating the pattern as we go along. While working on her right front my partner-in-crime became obsessed with the horizontal buttonholes, frustrated by the small hole created to the left of the button hole. Hole? What hole? Did I have the hole? Sure enough, I too had a small hole next to each button hole -- previously unnoticed, but now glaring. My friend's buttonhole quest lead her to Elizabeth Zimmermann's Knitter's Almanac and the "definitive" one row horizontal buttonhole. Needless to say, I ripped out my right front and reknitted the thing using this excellent buttonhole. At this point, experimental reader, I'm sure you're salivating to learn this ingenious buttonhole. Think me cruel, but I want you to learn this buttonhole from the original source. Really it's for your own good -- EZ is such a funny, opinionated, and clever woman that everyone needs to be exposed to her writings. Run -- don't walk -- to your nearest library or LYS, grab a copy of Knitter's Almanac and read the "July" chapter. It is little dodges like these that make a craft a joy; some of them one picks up from friends and enemies; some of them one discovers for oneself. nona considers the one row horizontal buttonhole to be a little dodge I picked up from a friend. Many of you will remember my left slanting decrease woes, followed by my challenge to invent a superior left slanting decrease -- nona thinks it's better to solve a problem then to moan and groan about it. I then proceeded to trot off on vacation and leave you all hanging. No longer my friends, today I'm going to reveal my results. After reading all your creative suggestions and comments, I came up with 7 left slanting decreases I wanted to compare. ssk -- slip 1st stitch knitwise, slip 2nd stitch knitwise, insert the left needle through the front of these two stitches and knit them together. ssk improved -- slip 1st stitch knitwise, slip 2nd stitch purlwise, insert the left needle through the font of these two stitches and knit them together. Recommended by Carrie and others. sl1, k1, psso -- slip 1st stitch knitwise, knit 1 stitch, pass the slipped stitch up and over the knit stitch. Recommended by Purly Whites. June's twist on the back -- "On the wrong side row, figure out which 2 stitches are involved in the decrease. Purl those stitches "backwards" - ie, with the left leg in front of the needle and the right leg behind (wrap yarn in the opposite direction around the needle). Essentially, this obviates the need to do the "slip-slip" part of SSK. When you get to it on the front side, all you have to do is knit the 2 st through the back as normal." -- June. Dave's evening out the lefties -- "Evening out your lefties is a two-step process. 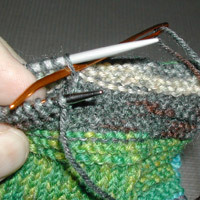 Do the SSK as slip 1 as if to knit, slip 1 as if to purl, insert left needle into front of stitches and knit them together. This is the important part. 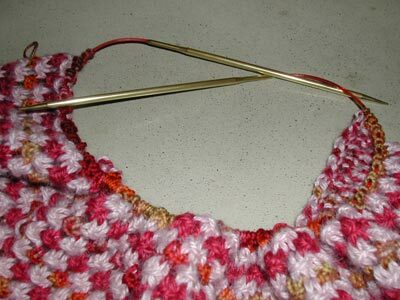 On the non-decrease rows/rounds, knit the stitch in line with that decrease through the back loop. This will smooth out the jag by 'lessening' the decreasing stitch and 'pronouncing' the non-decreaseing stitch." -- Dave. Several of you have suggested alternative ways to cross the stitches without using a cable needle. I experimented with these suggestions, but found using the cable needle did make a big difference for me. The next question is, which is my favorite? I actually have two favorites; #3 sl1, k1, psso and #7 my crossed stitch left slanting decrease. Now it's your turn to make a swatch and decide which is your favorite. Last, but not least, the prizes. I loved the spirit of all the left slanting decrease commenters and hate picking "winners" -- thank goodness for random number generators. And the random number generator says Anonyknits is our winner. Please email me your snail mail address and I'll send your prize out. It's been 48 hours since my call for submissions to the left slanting challenge. Thank you all, for contributing your ideas and expertise. I've been swatching quite of few of them -- you know me, I cannot resist a good swatch -- and will report on my opinions in the marrow. As I said, a bit awkward, but I'm quite happy with the results. Give it a try and see what you think! 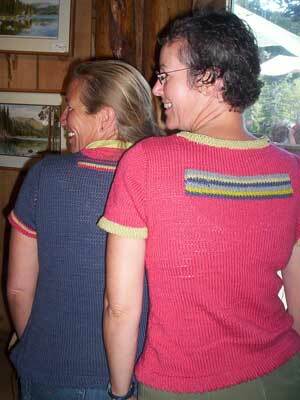 This morning my friend "no-sleeves" -- she's determined to get through 2006 without knitting a single sleeve -- and I were bemoaning the fact that the left slanting ssk decreases on our Picovoli Ts were not nearly as nice as the beautiful -- yes, beautiful -- right slanting k2togs. Now, you know you're a knitter when 1. you have these kinds of conversations with your friends and 2. you find them highly interesting and entertaining, but I digress -- back to my left slanting woes. I've tried all the major players in the left slanting world -- ssk, k2tog tbl, and sl1, k1, psso -- and none come close to the clean line created by the right slanting k2tog. Am I the only one having this problem!? nona thinks this calls for some out of the box thinking. Care to join in? You have 24 hours -- okay, 48 hours -- to put your thinking cap on and invent a new left slanting decrease. And there will be prizes! I know, I know, it's hard to see. You'll have to trust me. while the left slanting decreases are jagged.